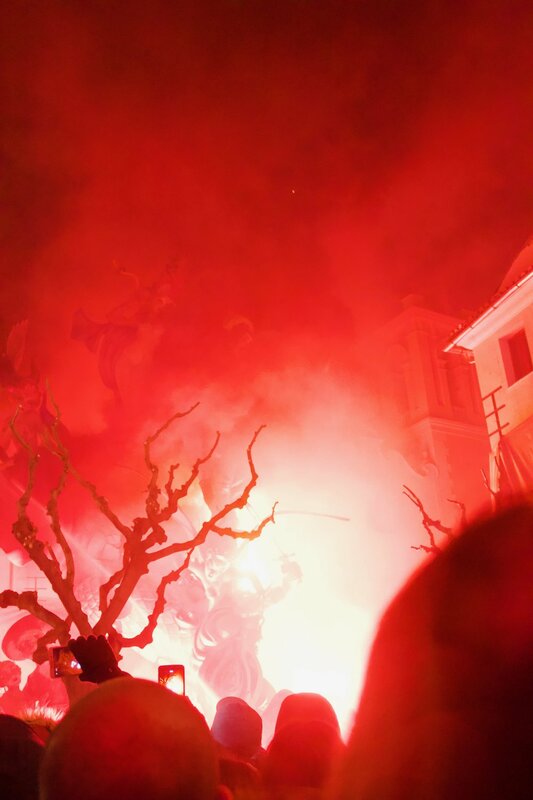 In the early morning hours of March 19, Las Fallas come to an end in a sea of ash, water, and ember. While there was no volcanic eruption or wildfire present, the antecedent festivities were just as explosive and all-consuming. 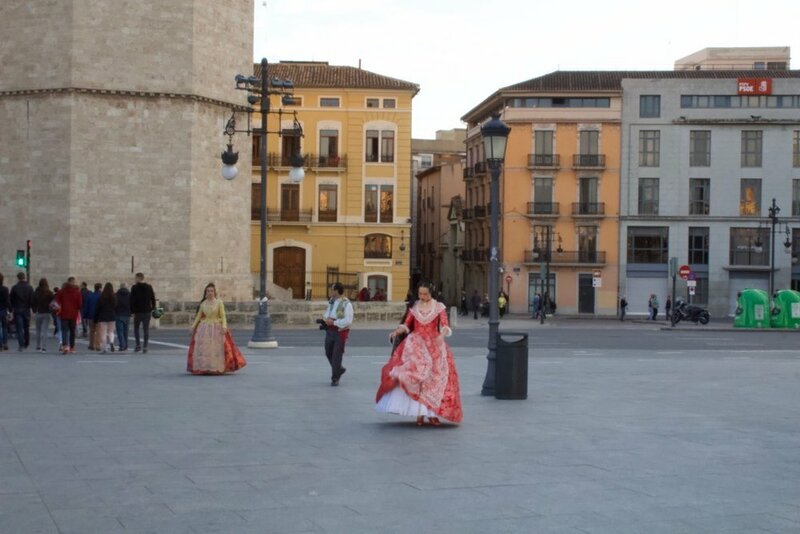 Yet instead of danger, fun and revelry were present as Valencians put their unique culture on display. In nearly every other part of the country, it was a normal Monday morning. Assuredly in the other 16 autonomous communities, people were sleeping soundly; recuperating from their weekends and regaining the strength to face another work day. But Valencians both native and transplant were watching the final firework display in what had been a nearly two-week-long celebration. In the days and weeks culminating into the end of the festival, all those in possession of a working set of ears were accosted by the sound of pyrotechnics both big and small--at all hours of the day and night. And this was no exception. I had been forewarned of this, by one of my favorite students. During a conversation class, I asked my kids what annoyed them the most about where they lived. This girl responded that she couldn't stand the barrage of firecrackers that were being set off in her village. She lived in a pueblo in the mountains, and apparently, the kids where she lived had little better to do than a set of explosives at all hours. I nodded and praised her for correctly articulating her annoyance in English. But as this was nearly a month before Fallas, so I had yet to experience what she was talking about. But, oh was I in for a shock. Two weeks later, I woke up to a sore throat and hail of firecrackers outside my window. It was the first day of my newfound role as a full-time digital nomad. I was sick and somehow had to find a way the properly articulate myself over the noise emanating from outside my window. All of my lessons were taught online, so positioned myself in front of a window so that my students can easily view me in the natural light. Luckily for me, (up until that point) there was a park outside my window and some of the teenagers had already begun their two-week vacation to celebrate the upcoming festival. I watched the faces of my students contort in confusion as they heard the explosion in the background. For those whose English level was high enough to understand, I explained the festival. This generally actually lead to reasonably interesting conversations. Everyone else, however, probably just sat and wondered how strange Americans were. To this day, I am not sure how I managed it. Perhaps an argument can be made that I hadn't; because by the time the actual festival had begun, my voice wavered between hoarse and non-existent. I was also extremely sleep deprived and "lifted" from the copious amount of natural cough syrup I had ingested. Regardless, when I stepped into the gates at Barrio del Carmen and saw the swarm of the people gathered by the Fallas, I was convinced. "This," I told myself, "was going to be a good time." By now you are probably thinking, "What exactly are you talking about? 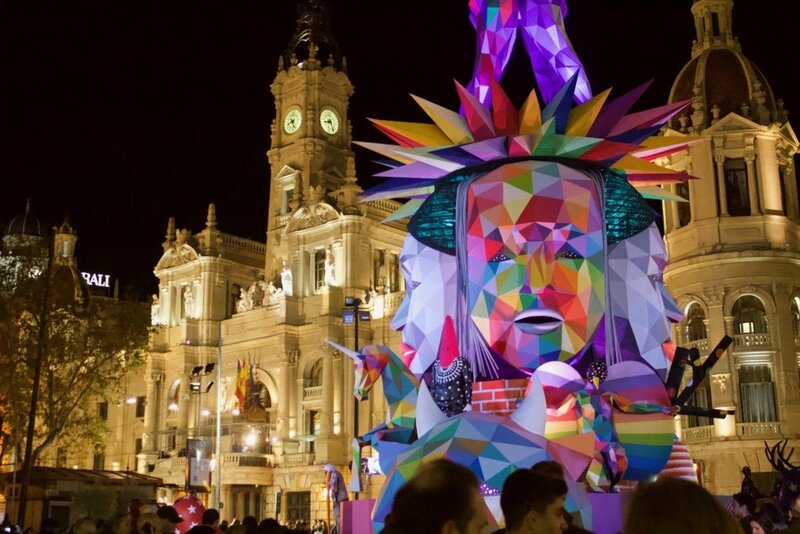 What is Las Fallas?" Well, before I quit I asked two of my coworkers the same thing. In fact, I literally said, "Que significa Fallas?" To which they replied (in English,) "Day Fallas iz day Fallas." (The Fallas is the Fallas.) I should have known better. Two years in Spain should have taught me never to ask Spanish people anything about their history or traditions because they never knew the answers. But here is what I learned during the festival both through observation and research. Fallas comes from the Latin word "fax" meaning torch. Each neighborhood in the Valencian province has a casal faller which spends the year fundraising in order to create these large monuments made of styrofoam, cardboard and paper-mâché. The results are astonishing. They are vivid and well crafted, like a cartoon come to life. It is truly a sight to behold. Something so unique and distinctive that you are unlikely to see it anywhere else in the world. As the festival took place in mid-May, it was colder than I expected it to be. In my drafty apartment, I kept my only heat source close to me. I had hoped that the cold would have lifted before the start of the festival, but it seemed that winter had no intention of going anywhere. Valencia has a reputation for being a rather warm city--an oasis of perpetual spring. But my time there revealed to me that that couldn't be further from the truth. It was also a much emptier, a much less sparsely populated city than I had imagined. The Wednesday before Fallas began, I walked down the street in barrio del Carmen and was shocked to see that not a single soul was in my proximity. Yet, in the week a Fallas, a wave of bodies had descended upon the city and brought in their wake excitement and warmth. And it was through this crowd that my friend Kacy and I made our way around the different neighborhood--admiring all the monuments around us. Each one grew more beautiful and elaborate as we passed through barrio to barrio. Some fallas were just a few feet off the ground, while others rivaled the buildings surrounding them. Each one had their own theme. And many of the most elaborate ones included both political and religious themes and parodies. No one was spared. We also had to work hard to avoid getting hit by--you guessed it--fireworks. I'll never understand how the legality of this. Or how no one had gone deaf or had been relieved of a limb in the process. But everywhere we walked we took precaution not to step on or stand too closely to closely to anything glowing on the ground. Funnily enough, the culprits of this terror were all under the age of 10. It was like all of the children in the city had turned into mini pyromaniacs. And their parents were more than happy to oblige them. It was both delightful and horrifying, but fun nonetheless. It was also a view into something that different and new and uniquely Spanish. For so long I had struggled to find any aspect of Spanish culture that I found truly distinct. I had had a little taste of it during the San Isidro in Madrid and La Feria de Abril in festival in Seville, but Fallas was on another level. I had long complained that so much of Spanish culture seemed like remixed poorly executed (black) American culture. All over Madrid I had been accosted by culture that was both familiar and outdated. For some reason swing/lindy hop was hugely popular in Madrid. At the same time Spanish versions of jazz, funk, blues, gospel and trap music all seemed to be an integral part of popular culture. I found all of this to be increasingly frustrating. Firstly, because it was usually done poorly and secondly, because I did not come to Spain to be confronted with bastardized versions of my own culture. But during Fallas, I was surrounded by people who were celebrating themselves. Although they probably did not know the origins of the festival, it was theirs to revel in. All over the city, there were parades and parties with people dancing around the street. It was a wonderful celebration of love and life. And a warm welcome to Spring. For me, it was also a wonderful way to rejoice in the new life that I had started for myself. And it was with that sense of satisfaction that I watched as the entire city went up in smoke. One by one well into the early hours of Monday morning all of the monuments came crashing down. All the beauty that I had witness vanished in a manner of minutes. And it was a sight to behold--although one that I will not be anxious to repeat. By that time rain had emptied out the city of both the crowds and the warmth. And in the cold I stood in a crowd of true Valencians screaming and shrieking as the embers burned holes into my afro. But regardless, I was happy to be there. And it also gave me a new perspective on my former coworkers response, maybe because there was no way to define it--only experience it. And in that sense they were right--the Fallas is the Fallas.